Contents of the book Read the book online Where to get the book Who is Abdrushin? Anything of true value can never be gained without a great deal of effort. This is true especially when seeking the Truth and real knowledge, because Truth and real knowledge are anything but cheap clichés and the smooth talk that is often mistaken for real knowledge. The work In the Light of Truth enables us to learn unspoiled and simple Truth through its perfect description of the whole of Creation and the functioning of its Universal Laws. Specifically we can find there the clear and straight path guiding human spirits to self-realization, spiritual development and their return out of this material world back to the spiritual world from where they had descended for the purpose of developing their souls. Like any other book, the book In the Light of Truth can only point at the Truth, because Truth itself is not expressible in human words and therefore cannot be put into a physical book. Instead it is far more important to live the written word with our spirit than it is to learn rational facts. Only while fully absorbing each sentence and comparing your own life with the natural laws as they will be shown in front of your eyes in their perfection, will the book In the Light of Truth become useful to you. As a matter of fact, any knowledge that offers information only is of no real value, if at the same time it does not lead us to full spiritual consciousness and provides us the ability of differentiating unmistakably and in all situations of our daily lives that which is essential from what is irrelevant, that which is true from what is false, that which is worthy from what is worthless. If you read the book In the Light of Truth very carefully, and if you were to let each sentence fully come to life within you, then it could happen to you that you might not remember much of it, but everything you feel inside will then have become alive. And you will be able to automatically apply all of it to your life without need to remember how it was written in the book. The Truth will become your own knowledge and you will feel it clearly inside of you without the need of either thinking or meditating about it. The inner voice is the faithful connection between the spirit and the Light and allows you to perceive clearly and every moment of your life what is or what is not in harmony with God's natural laws. If you have not read the book In the Light of Truth yet, then we would encourage you to read the lectures in this book from the beginning and in the same sequence in which the author has placed them there. This is important, because each lecture brings new information that causes the necessary spiritual growth to occur for readers to then fully comprehend all the new information that is offered in each subsequent lecture. Reading the book In the Light of Truth is not too easy. Full concentration and spiritual watchfulness is demanded of the reader. But the effort of reading is work on ourselves at the same time and helps us in our spiritual ascent, without which it is impossible to find the Truth. The book In the Light of Truth does not offer ready-made opinions, instead its author, Abdrushin, encourages us to strictly and objectively examine the knowledge brought by him. However, if it is your intention to contest or criticize the Truth that is contained in the book, or if you want to prove your own opinions and prejudices, or if you wish to make the author the idol or the subject of fanatical following, then you are wasting your time. The book In the Light of Truth is meant for sincere seekers who want to live according to that Truth and who want to return to living in harmony with God's natural laws again. If you will read the book In the Light of Truth with a real desire for knowledge and without all prejudice and rigid dogmas, then you will find treasure in it that is incomparable to all the treasures of the world. For every seeker the work In the Light of Truth is the best source of knowledge we can recommend. Our web pages are but opaque reflections of the knowledge you can find in that book. If you possess at least a shred of desire for the Truth, then this book will ignite a flame of knowledge in you that will never go extinct. „Come down from the Cross"
„I am the Resurrection and the Life, no man cometh to the Father but by me!" I am the Lord thy God! thou shalt have no other gods but Me! Thou shalt not bear false witness against thy neighbor! Do not let thyself lust after thy neighbor's wife! 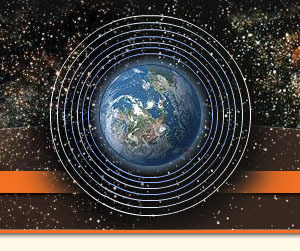 Resonances to the Grail Message by Abdrushin I. All that is dead in Creation shall be awakened, so that it may pass judgment upon itself! Let Easter revive in you, man! Who don't want to know my Word now for something else, them I will not know at their hour of need! Resonances to the Grail Message by Abdrushin II. See what is of benefit to you! When the misery is highest, God's hepl is nearest! 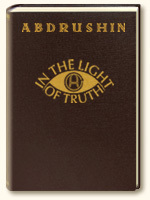 Abdrushin wrote the book In the Light of Truth in the German language. Please consider that any translation from a foreign language can never fully measure up to its original. However, this does not stand in the way of understanding the simple Truth, what Truth in its perfection really is. He who does not endeavour to grasp aright The Word of The Lord makes himself guilty!